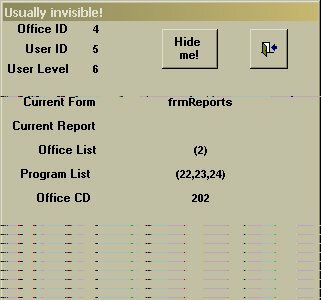 Back in Feb-2003, Tobi Hoffman wrote an article about using invisible forms in conjunction with Citrix or Terminal Services based Access databases. Since then, Tobi has discovered that adding an invisible form to your application can make a number of difficult tasks much easier. 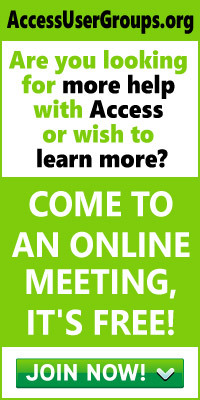 Over the past year, my article on invisible forms has brought me a fair number of inquiries from Smart Access readers, though most questions were about the use of Citrix rather than the invisible form itself. That’s too bad, because I’ve found that including an invisible form in my application is a useful tool, so much so that it’s a topic worth revisiting to show what an invisible form can do for you. Two years ago, I had a problem with an application that was running on Citrix, which is a virtual desktop that many people can come into in order to use a single copy of a program from several different locations. The problem was that all users were going into the same actual directory and using the same actual front-end database. In general, this is a bad idea in database design because, on a normal network, it’s often slow and can lead to database corruption (though that’s never occurred in my experience with Citrix). The invisible form was something that grew out of the need to keep some pieces of data unique to each user so that people didn’t interfere with each other. While it worked superbly for this purpose, I eventually found a way to temporarily copy the front end to each user’s Citrix desktop, and the original need for the invisible form disappeared. But, in the meantime, a host of other uses popped up. How many uses? I did a search in my application on frmCurrent, as I named the invisible form in my application, and found 288 references–288 places where I found using an invisible form solved a problem for me. These 288 places fell into roughly eight categories, and once I started thinking about how I used the invisible form, I found even more uses for this strange object! DoCmd.OpenForm "frmCurrent", , , , _ acFormReadOnly, acHidden Forms!frmCurrent!txtUserID = lngUserID Forms!frmCurrent!txtUserLevelID = Me.cboName.Column(3) Forms!frmCurrent!txtOfficeID = Me.cboName.Column(4) Forms!frmCurrent!txtCD = Me.cboName.Column(6) Me.txtReport = "" Me.txtCustomers = "X" Me.txtOffices = "X"
You could, of course, use global variables to hold this information. But the benefit of the invisible form is that I can choose to make the form visible during development. This makes it considerably easier not only to check these critical values, but also to change the values directly as part of my testing process. Also, by caching this data in my invisible form, I avoid repeated trips to my database to extract information: I just retrieve the data once and store it in my invisible form. Also, unlike a global variable, I can put code in my invisible form to take action, based on the data in the form (sort of an Access user interface way of implementing the equivalent of a database’s Trigger). In another application, the main piece of data that I dealt with was the Project entity. For billing purposes, each Project was assigned a Charge Number and Task Number, a unique combination for each project. Since any Project could have multiple Charge/Task Number combinations, I needed a subform to show that detail. However, when the Charge/Task subform is on a non-Project form (for example, the Audits form), I needed to give my users a way to find the Project associated with the Charge and Task. I built a form to show each Charge/Task Number and the Project associated with it. A double-click on any Charge/Task entry would find the associated Project. But how to integrate this form with the Audits form, the Financial Summary form, or any of the other forms that listed Charges and Tasks? Furthermore, I had to keep the Contracts and Financial data separate (remember, “look but don’t touch my data, please”). Instead of making multiple copies of the find-it form, which would be launched from a customized Find button on many forms, I made my find-it form a Menubar item. But now the question was how to tell which form my find-it routine was being called from. One note about this code: Don’t let IntelliSense fool you. You won’t see the Visible property appear in the IntelliSense dropdown list when using this code; the Visible property is there, but is itself invisible (at least in Access 95, 97, and 2000). It won’t pop up in the list, but you can use it anyway. ListBoxItems = "(" & strS & ")"
In this case, I’ve expanded what is meant by “current report.” I now know what the last report the user looked at was (what the user thinks of as the “current report”) and can work with that report even if the user doesn’t have it open on the screen. Think of the invisible form as a space for storing global variables, with the advantage that you can easily check what they are while you’re developing your application. Think of it as a cache for frequently used data that will make your application run faster because you won’t have to keep querying your database. Think of it as a very useful tool.